We have just returned home from a three week trip to the North of England where we spent time with our family, enjoyed a bit of British life and were treated to an early spring, which is still yet to come here in New England. One of our favorite parts of the trip was, of course, the food. Every little village we stopped in was full of charm. 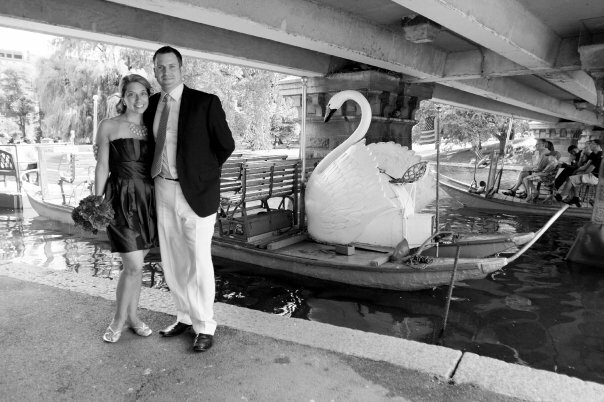 We loved the green grocers, cheese shops and amazing butchers…all of which are nonexistent in our regular life. 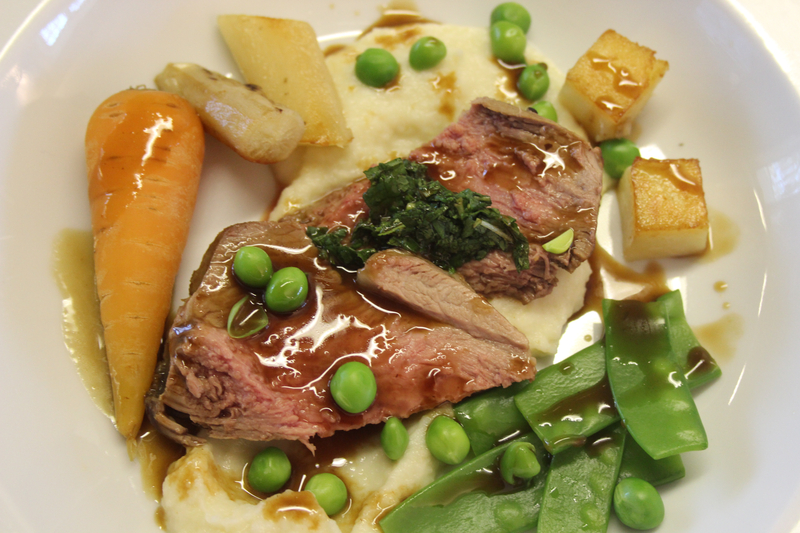 For one of our last family meals we wanted to celebrate Easter a little early and paired a lovely rump of lamb with salsify and spring peas. 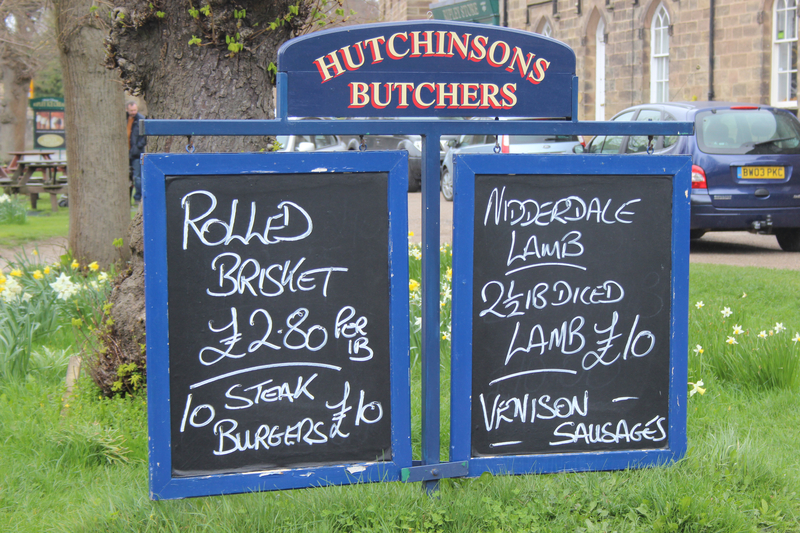 Our first stop was to Hutchinsons Butchers in Ripley, Harrogate. 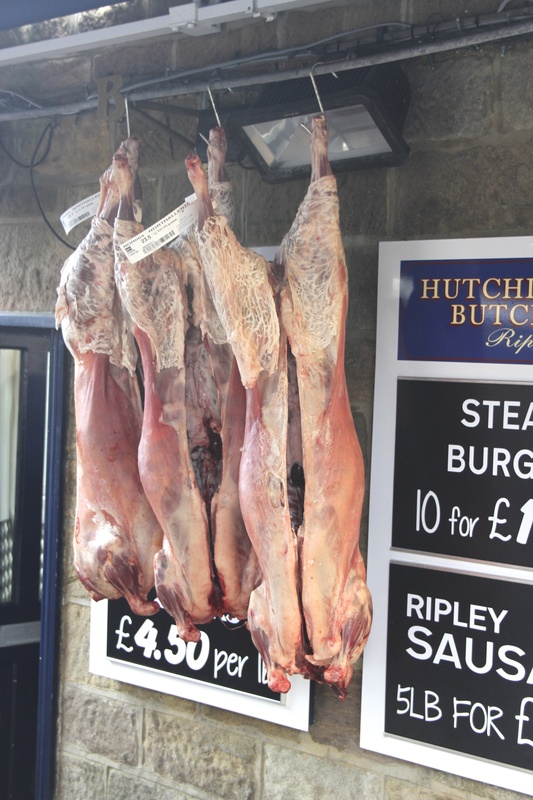 Set in a charming estate village, Hutchinsons Butchers is a tiny little boutique store set back from the road where the butchers pride themselves on only selecting the most traditional, quality meats. 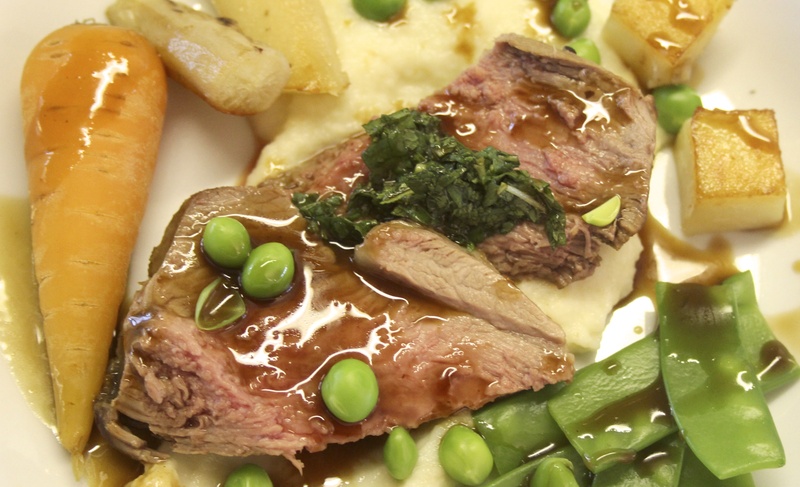 Finding lamb in the US is not an easy task. We knew we had arrived at the right place when we approached the shop and waited in the drizzly mist amongst a line of people who were allowed in one at a time to select their purchases. 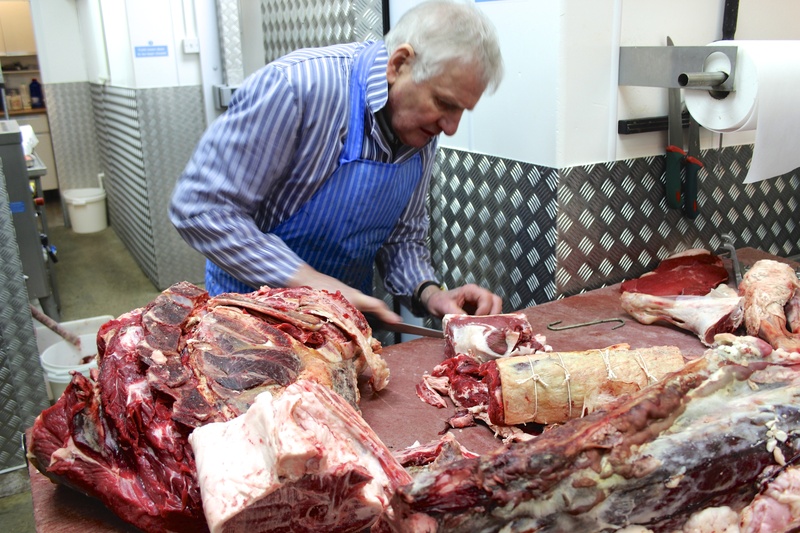 Traditional butchers in England still hang and age their meat. You can really see the quality of the meat and it is so much better than the usual plastic wrapped tray that we are used to seeing in super markets. When it was our turn we asked for a rump of lamb with the bone in. They hand cut your selection right there next to you and are extremely helpful in advising you which cut will work best for what you are making. 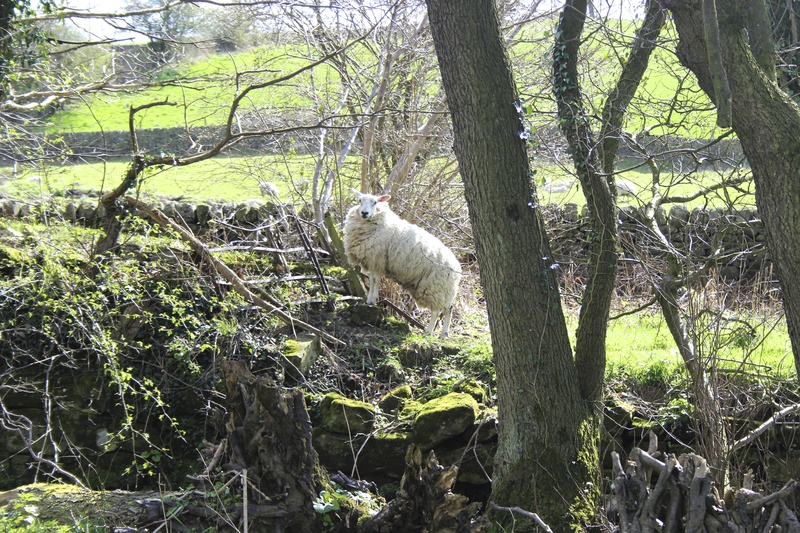 This lamb was local to the area and came from about 15 miles north of where we were staying. We chose the Rump as it can be cooked fairly rare, however, traditional (long roasted) leg of lamb is also one of our favorites. 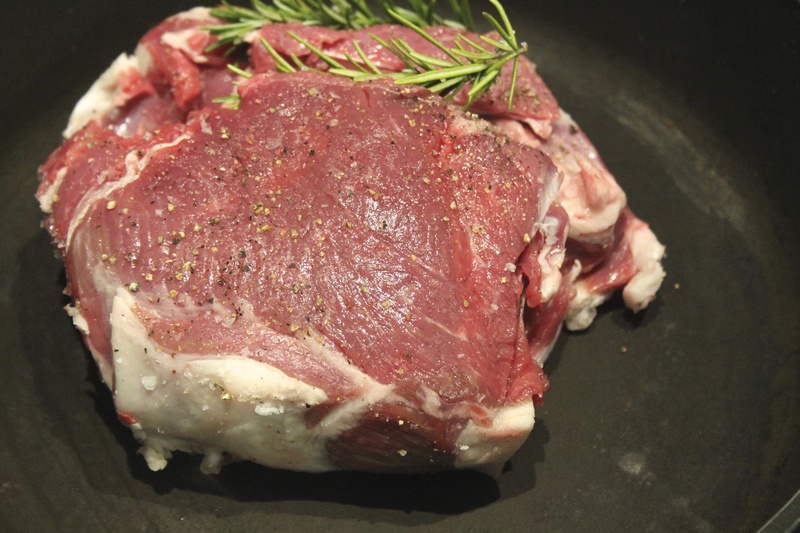 (Tana Ramsay, the wife of Chef Gordon Ramsay, has a great “Rustic Shoulder of Lamb in her book Tana’s Kitchen Secrets). 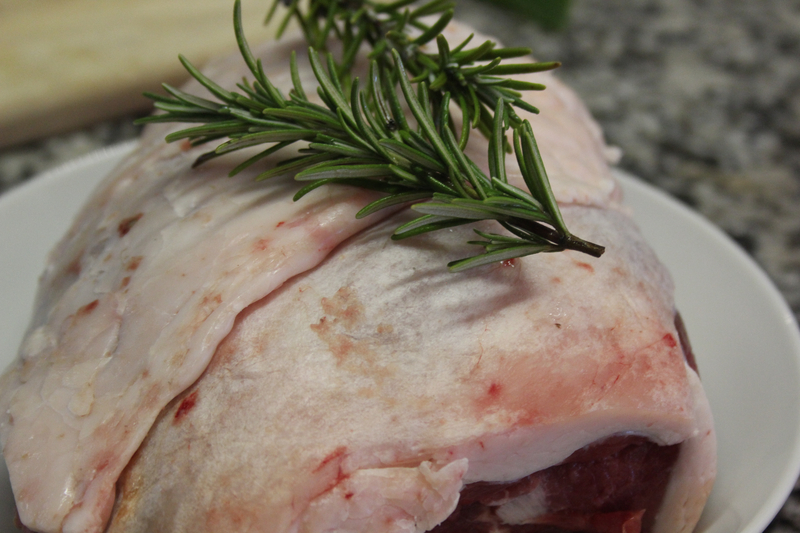 Although roasting with the bone in is a great way to cook this meat, we wanted the bone to make a sauce for our dish. We removed the bone and then roasted it in the oven. Once roasted, we added onion, celery, carrot, bay, one garlic clove, 1/4 cup of red wine, 1 cup of homemade chicken stock and 1 cup of water and then simmered for one hour. We then strained it into a smaller sauce pan and reduced until it thickened. 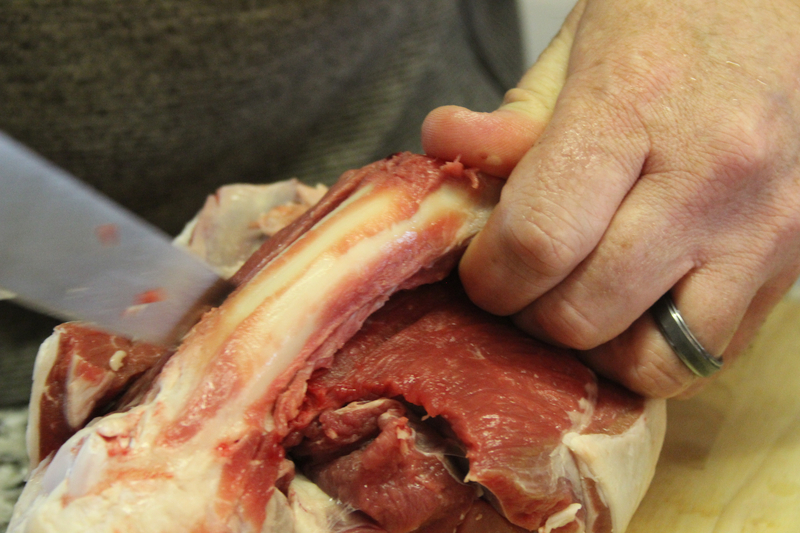 We asked the butcher to keep the fat on the lamb. With a sharp knife we gently scored the fat then placed on a little rosemary. We salted and peppered this meat well on all sides then seared it on all sides before placing in a hot oven (430f) and roasting. We turned the Meat every 10 to 15 minutes. If, like our family, you prefer your meat on the rare side, then roast for about 20 minutes per pound, for medium 25 – 30 minutes per pound and for well done 35-40 minutes per pound. We would also advise that if you are planning well done then cover the meat with tin foil for most of the cooking time removing it for only the final 10 minutes of cooking time. Once roasted we removed the lamb and let it rest for 20 to 30 minutes. 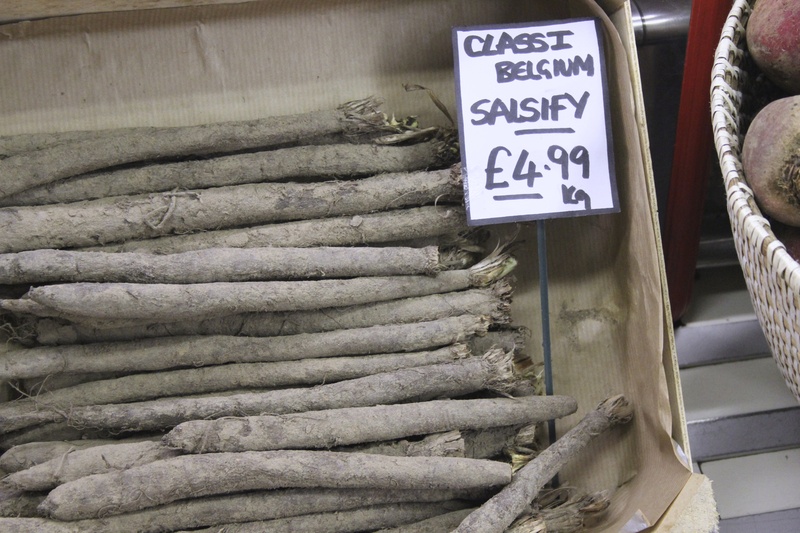 Salsify is one of those vegetables we don’t see in the United States (at least not where we live). It is a white root vegetable that is compared to the parsnip, although we didn’t think it tasted like a parsnip but maybe more like an artichoke heart. We found some at this adorable little shop on our way out of Harrogate and decided to give it a try. As it was being served with Lamb, we decided to poach it in some lamb stock. 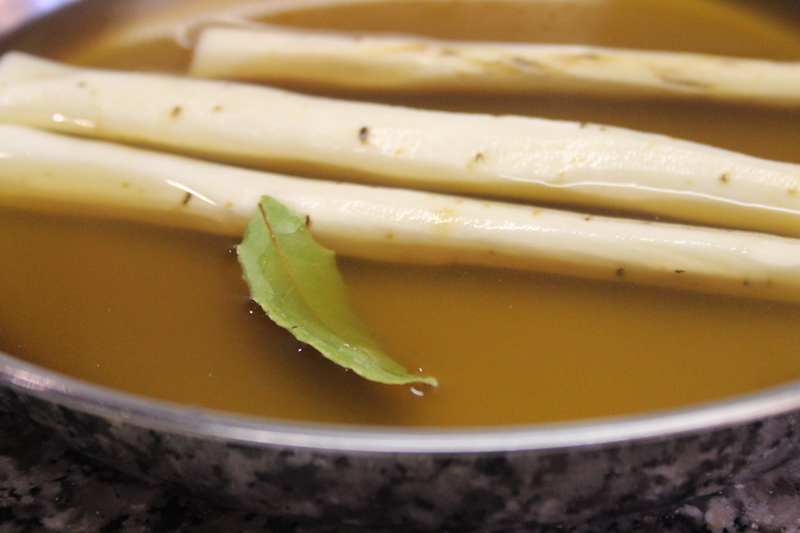 We peeled the long pieces and then poached them in lamb stock to which we added one bay leaf. We covered (a simple parchament cover works well but so will tinfoil). Then braise until tender. Remove and allow to cool . Then a quick sear is all that they need just before serving. We cut small cubes of potato and cooked them in the same way. Easter is all about spring and new life. 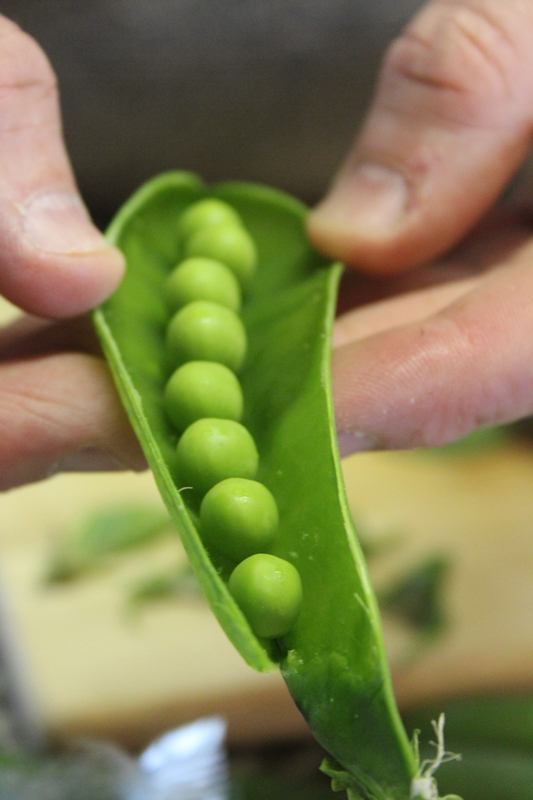 Fresh peas straight from the pod are the perfect green vegetable for this dish. Simply remove from the pod and blanch in boiling water, we also had a few Mange Tout (snow peas). A tip that we often take for granted is to salt this blanching water so that it tastes like the ocean (that is very salty!). You will be amazed at not only the flavor but also the color of your blanched vegetables. 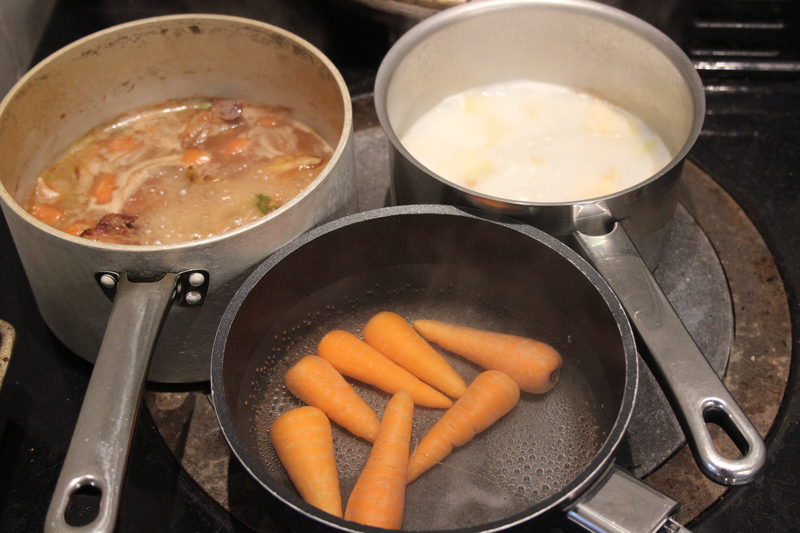 The root vegetables that we chose to accompany the lamb were spring carrots (cook until tender) and celeriac (celery root). For the celeriac, remove the outside skin (you can add this to your stock) then cube the root. Cook in milk or cream until very tender then blend and season. A spoonful of creme friache gives it a great depth of flavor. 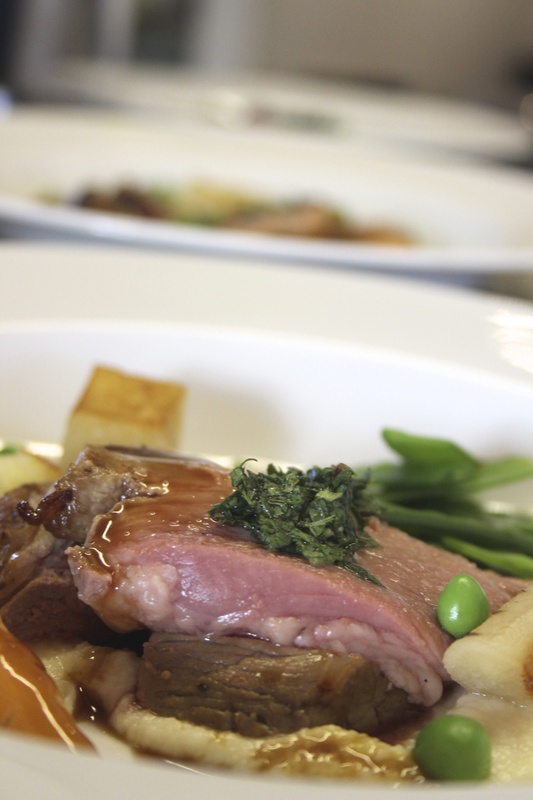 Place a little of the puree then a few succulent slices of lamb and scatter the seared salsify and potato around. Add the peas and some carrot then finally sauce and serve. Take fresh mint leaves and chop finely. Add these leaves to a little cider vinegar and a sugar to taste. Let stand for half an our before serving. Whilst not served here, an alternative to the mint that we found in the eighteenth century cook book Recipes from the White Hart Inn by William Verrall, is a cucumber sauce. His recipe: Slice cucumber then squeeze dry in cloth. Flour them and brown, then add some stock, red wine, salt, pepper, mace, and nutmeg. Add a little butter whisked in just before serving. This meal was the perfect ending to a lovely trip. The flavors complimented each other and provided that comfort food feeling that you want with a family dinner without being too heavy. Now if you do have any leftovers, then cold lamb can be sliced to make great shepherds pie or Lancashire Hot Pot (Clarissa Dickson Wright, R.I.P, has a divine recipe for Hot Pot in her book Clarissa’s Comfort Food). 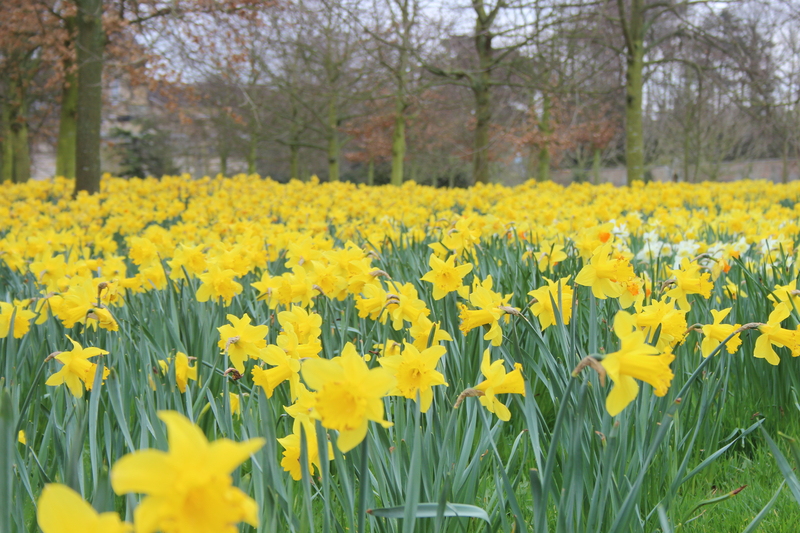 We were spoiled with the lovely daffodils, long walks through the Yorkshire Dales and springtime air. Here is hoping that mother nature catches on and brings a bit of this springtime wonder to Massachusetts. Happy Easter!